Parts bins are a great organizing tool in shelving, but have you ever wished that you could get parts bins for your pallet rack? Quantum Storage has just announced a new product to address that wish. 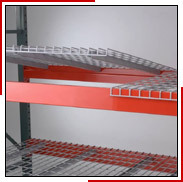 Rack Bins are 42” deep and stackable to fit into standard pallet racking. Instead of wasting space above a shelf level, stack two or three bins to make the most of the usable space. 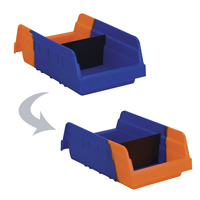 The bins have front, back and side grips for easy handling. The bins are available in 16 ½” wide, 19 7/8” wide and 3 7/8” wide (by 17” ½” tall and 41 7/8” deep) and come in two colors; Blue and Gray. 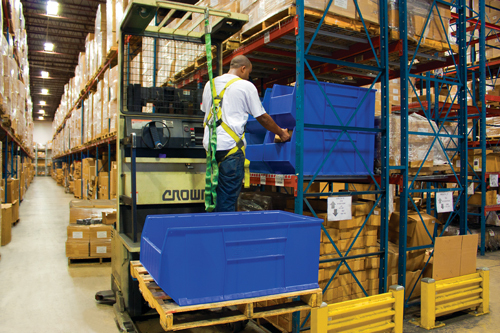 Need Big Bins for Narrower shelving? Quantum also makes big bins for 24”, 30” and 36” shelving! Contact Atlas at (800) 842-9188 for more information. Winter is coming: check your Dock Seals. Yes, the fall weather has finally arrived and it’s good to take some time off to enjoy it. As we all know, the winter months will soon be upon us. 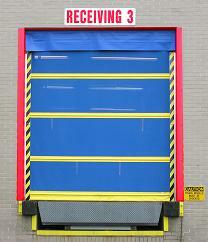 For manufacturing sites and distribution centers, dock doors are a huge drain on heating bills. Every time a truck pulls in to load or unload, the dock door comes up and all the heat goes out into the winter air. 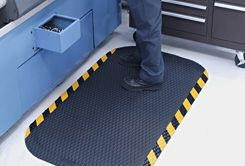 A dock seal creates a barrier between the truck and the dock opening to prevent the huge loss of warm air. Dock Seals are a very reasonable investment, ranging from $700 to as much as $2000. In the dock seal world, “you get what you pay for” is the rule. Buyers should take a close look at the performance versus the cost. The performance of dock seals range from as low as 250 cycles, a cycle being each time a truck pulls in/out, up to 10,000 or even more cycles. If you have a dock that only gets 1-2 trucks a day, then a lower cost dock seal may be all right for you. For high traffic docks, high-performance materials are a better investment. Make sure your vendor lists a cycle rating for any seal quoted. Please keep in mind that higher performance seals also use pleating, double stitching, weather resistant wood backing and other features to extend the life of the seal and prevent damage. So, now is the time to take a look at the dock seals on your building and get the repaired or replaced before the cold weather sets in. I am a big fan of CBS Sunday Morning. I finally watched the episode that aired a couple of weeks ago and that program contained a really interesting story about BMW. They have recognized that their workforce is aging and that they may need to make some changes to accommodate older workers. By 2020 16% of the population will be over 65 years of age, so this is a problem common to all US companies. BMW took one production line and staffed it with people approximately 47 years of age, since they expect their workforce average age to be 47 in 2017. They just talked to the people on the line and asked how the company could make improvements for them. The company purchased custom shoes for everyone on the line and installed wooden floors, since aching feet were a universal complaint. They also added lighted magnifiers for people that were inspecting parts and new computer screens that offer larger type. One man requested a place to “stretch” when he began to feel fatigued, so they built some bars on a nearby wall so he can go over and limber up. In total, BMW spent a measly $50,000, including lost time. Here’s what they got in return; Absenteeism dropped below the plant average; Productivity increased 7% and defects dropped to ZERO. The program was so successful, that they are expanding it to other production lines and other plants. That’s a great productivity plan for any company. I have been working on some dock issues this week. The biggest problem is for a customer that is having a problem with flies in their warehouse. Insects in a building can be more than just a nuisance. This customer said they were inundated with insects from a nearby operation and the people working in the warehouse spent most of the week swatting flies: not very productive. Other insects, such as mosquitoes, can be a health hazard since they are disease-carriers. In addition, flies can contaminate finished product. It wouldn’t be great to ship your customer a box full of flies or bugs! 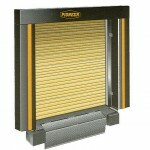 There are several solutions to this problem, depending on the frequency of use for your dock doors. Many companies don’t like strip curtains because they are hard to see through and of course, they shut out airflow. So, a bug screen door is a good solution. The first style is a “pull-across” curtain made from heavy-duty screening material. The screen is made from Vinyl encapsulated woven polyester mesh and just pulls across like a curtain. This would probably be indicated for low traffic doors or doors that are only open for ventilation. The second style utilizes a track, and operates just like a garage door. There is a manual or powered version, depending on the amount of traffic using each dock door. This material is rugged and will keep out insects as well as birds. In the winter, you can exchange the screen panels for vinyl to add insulation around your doors. The modular design also means you can replace a single panel if it gets damaged in some way. Adding bug screens is a good enhancement for employee comfort, product cleanliness and improved ventilation in your building. Work positioning is a big challenge for many industrial manufacturers. I have seen countless tool and die makers hunched over worktables that are just too low. Often, the size of the piece makes it very difficult to work with even if the height is adjustable. Many assemblers of bigger items, such as lawn mowers also have problems reaching the entire assembly. These poor postures result in back, neck and shoulder injuries. In addition, eye problems are common, since the worker blocks out the light needed to see the project. There is a super product from Ergotech called an Ergo Chief. This is a motorized height adjustable pillar outfitted with a slotted turntable that easily accepts mounting of any tool, fixture or work part. It has foot petal controls for the height and rotation speed. The controls are variable speed so the user has accurate control of speed and rotation and can even reverse rotation at any time. The Ergo Chief handles loads up to 400 pounds. This product is also available for welding production lines. For applications where less movement is needed, Ergotech also offers the Ergo Master, a manual height-adjustable pedestal that can be set to any position in a 360 degree hemisphere. If you have an application where height adjustment is the only need, then the Ergo I is a very economical tool to improve work positioning challenges. For production lines handling larger products, such as auto assemblies, there is the programmable Ergo Control that offers 3-axis positioning of workloads, up to 13,200 pounds! Ergotech products are engineered and manufactured in the United States. They have a number of exceptional products. Check out their website at http://www.ergotech.com. I have been ignoring my blog on material handling because I have been very busy generating a proposal for a large, and rather complicated mezzanine. For this customer, the total is pretty large (over $100,000), but looking at the cost per square foot (about $20.00), it is certainly less than the alternative of adding building space. Adding the mezzanine also offers more advantages. The addition of a building adds square footage, but it also adds more travel time within the building. This particular customer moves everything on carts, one at a time, so it is a big price tag to add another 250 feet to the travel on those carts. Additional square footage adds lots of costs: moving, utilities, maintenance and taxes to name a few. For a large company, even planning a move can cost double or triple the cost of a mezzanine. The mezzanine will depreciate as a piece of equipment in 7 ½ years, unlike a building addition, which will depreciate in 39 years. If your company is profitable, the write-off can be significant (contact your tax professional!). Another big advantage of the mezzanine is that it can be modified, moved or sold in the future. We have several customers that have built mezzanine levels in several sections, as funds were available. One never knows about the future, so it is great to know that if your company relocates, the mezzanine can be taken down and moved to the new location. Stick built structures can’t do that! There are lots of companies manufacturing mezzanines, so do your homework. You should not deal with any company that does not have structural engineers on staff. When you get a quote, it should detail the structure, size of beams, columns and all the weight capacities and loads. If you don’t have that information, then you can’t really know what you are buying. Some suppliers use lighter-weight structure, and the product costs less, but you probably won’t be happy with the finished product. In the mezzanine world, you get what you pay for. We received a product bulletin today from Valley Craft concerning their new power Drive Drum Handling equipment and I though it would be a good subject for the blog. Handling drums is a major problem for many companies. Drums are big, heavy and often full of some kind of chemicals that should not be spilled. I have worked on numerous drum-handling projects over the years, often after an injury has occurred. A large number of the cases I have seen involved moving drums by hand- 1 or 2 people tip the drum and then roll it slowly where it needs to go. It’s really hard to get a drum off of or onto a pallet. I have also seen a number or injuries caused by moving a drum with a drum dolly. It’s a lot of weight to “break over” so that the load is on the wheels, and this often leads to back, neck and shoulder problems. You can get an attachment for your forklift that will handle drums with ease, but a lot of companies just don’t have the floor space to operate a forklift in the area where they store and access drums. A simple way to handle drums in limited space is with a Roto-Lift or Roto-Grip from Valley Craft. These machines look like a pallet stacker, but come with an attachment that clamps around the drum to lift it. The straddle style fits on the corner of a pallet, so you can easily lift or place a drum on a pallet. There is also a counterbalanced version, which eliminates the outriggers and makes the lift more maneuverable. Using these lifters make drum-handling a one-person job and greatly reduce the chance of injury, dropping or spilling a drum. The Roto-Lift and Roto-Grip will also rotate the drum so the contents can be dumped. The new versions are fully powered, so the machine does the pushing during travel. Any operator can move up to 1000 lbs. with the power drive wheels and full hydraulic lift functions. The use of the power drive decreases injury risk by another 50%. These lifts have the added benefit of easy maintenance. You are currently browsing the archives for the Material Handling category.